Dr Siegwart Bruehl, born on 22 July 1857 in Bromberg, Germany, gained his MD qualifications from Halle in 1881 and passed his Staats Exam in 1882 in Berlin. Without any further delay he booked his trip for Australia and arrived on the Marsala from Hamburg at Newcastle in early August 1882. From there he made his way to Adelaide where he registered, and was accepted, Certificate 323, as a Medical Practitioner on 6 December 1882. Soon after his arrival in Adelaide he left for the north of South Australia and started a practice in Hawker in 1883. Hawker had recently been connected to the Transcontinental Railway, later known as the Ghan, and was expected to become a major railway town. During his time there he travelled far and wide as many of the newly opened railway, agricultural or mining settlements had no resident doctor of their own. When the United Ancient Order of Foresters was started in 1883 he was among its first 20 members. Advertising his services in February 1883. In early January 1884 he was telegraphed from Blinman to attend a badly injured miner. To make it possible for a doctor to attend and for people to pay for his services several of these towns would implement some kind of Medical Benefit Scheme. After Farina had been connected by rail from Hawker Dr Bruehl was asked if he would be willing to operate under such a scheme. He would receive about � per annum for visiting the town once a month. Members at Farina would pay �per year for singles and �for married couples. Non-members would have to pay � per visit if they needed a doctor. The scheme operated successfully until 1899 when Dr Bruehl left for Naracoorte. He was replaced in Farina by another German doctor. This time it was Dr Edward Hoche. He was later joined by his wife and two children but left for Birdsville in 1893. While working from Hawker Dr S. Bruehl was much respected and did well financially. He was often invited to attend social functions. On 6 October 1884 he was present when the Local Court was opened by JP Buttfield. Among others attending this occasion were J Edgeloe, JP and JC Turner of Moralana Station. In September 1886 he was appointed Member of the Board of Advice for schools in the Hawker district. He had become a small landowner and in 1888 Dr J. Bennett leased a block of land in Fifth Street, Hawker from Dr Bruehl. To make it possible for Bruehl to attend to the sick, who did not have the means to pay for his services, Bruehl wrote a letter to the Hawker Council to appoint him as Medical Officer for the District to the Destitute Poor. In 1889 he went back to Germany to study eye and ear diseases. It was during this time that he married Minna Viesel. He was back by the end of the year and was welcomed warmly. The residents gave him a dinner, Mr. P. O'Connor presiding. The usual toasts, songs, and recitations whiled away a pleasant evening. 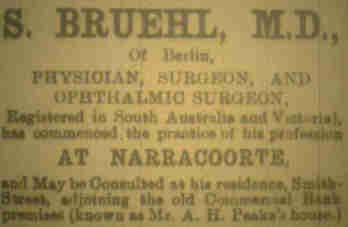 Bruehl bought Dr Bennett's practice in December 1891. The couple had three children in Hawker, Charlotte Josepha, born 3 September 1892, Siegwart Martin, born 6 February 1895 and John David on 15 March 1897. John died at Hawker on 4 January 1898 and was buried by Father Hanaran. In November 1898 he left Hawker due to ill health. The family moved for a short time to Queenscliffe on Kangaroo Island but had moved to Naracoorte by May 1899. Having settled down in Naracoorte their fourth child Anton Justus was born there on 11 March 1900. Anton would eventually become famous and known all over the world ...... except in Australia. Dr Bruehl's stay at Naracoorte was only of a short duration. While there he had several runnings with the Hospital Board and the local doctors. There was a distinct animosity between them. Bruehl would treat patients but not in conjunction with other doctors. They in turn objected to Bruehl attending patients at the hospital. 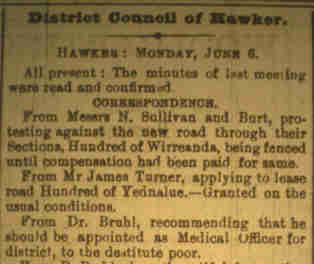 On 22 February 1902 the Borderwatch reported that Bruehl had been appointed to the Malcolm Hospital in Western Australia. There is no evidence that he actually went there, but later he would claim to have been there. In October 1902 Bruehl accepted a position at Denial Bay. He stayed until early 1904. Once again he was working under the town's medical scheme, known as the Denial Bay Medical Society, and travelling hundreds of kilometres along the West Coast and Eyre Peninsula. The Advertiser of 4 April 1904 reported that 'Owing to the recent removal of Dr S Bruehl from Denial Bay, there is no physician along the whole coastline of this district'. After having experienced the dry conditions at Hawker and even more so at Denial Bay, the family was on the move once again. Both the Mildura Cultivator and the Federal Standard reported him working in the Mildura and Wentworth area between June and August 1908. From there he seems to have moved south to central Victoria. All postings there were of a rather short duration. Rupanyup for less than a year, Moyhu about 1 year, Woods Point lasted nearly three years. 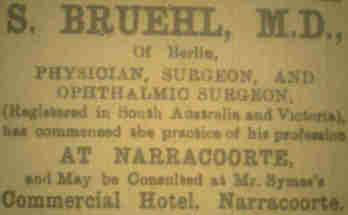 From March 1911 Bruehl advertised his services in the Colac Herald. He could be consulted at his own residence, near the Public Hall in Beech Forest and fortnightly at Laver's Hill on Sales days at the hotel. In January 1912 his 20 year old daughter provided a very successful musical entertainment in aid of the Colac Hospital. Early 1914 he was still at Beech Forest but later that year he had moved closer to Melbourne. In October he was consulting at the corner of Arthurton Road and Hartigan Street opposite the Northcote Station. In May 1916 he practised at 216 Queen's Parade, Clifton Hill. Later that year he was working in Carlton. By this time the First World War was raging and being a German, Bruehl noticed the dislike of Germans very much. Bruehl's children on the other hand had far fewer problems as they were born in Australia. Bruehl's daughter, Charlotte, obtained her diploma of Licentiate of the Academy and Royal College of Music at Camperdown in October 1913. While living at Beech Forest, Bruehl made once again an application for the Certificate of Naturalisation on 27 August 1914 and was declared 'a person of good repute'. According to Bruehl he was Naturalised some 20 years before but had lost his papers. Bruehl took the Oath of Allegiance before a police magistrate in Victoria on 31 August 1914. From 1916 onwards he was investigated by the Australian Military Forces Office in Melbourne. Its report stated that Bruehl had been Naturalised in South Australia in 1891 but had lost his papers during a fire in Western Australia. It continued that while in Hawker he was a very popular man but left a broken man in health and also financially. He was supposed to be a 'drug fiend'. 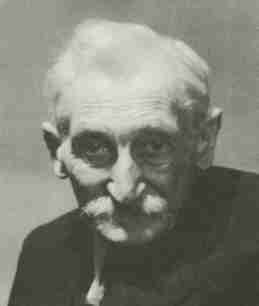 It described him as an old man of small statute, decrepit, heavily addicted to morphia and speaking with a strong German accent. He was also suspected of harbouring strong enemy sympathies. In an undated letter from the Secretary of the Department of External affairs it was stated that 'Referring to your application for naturalisation, I have the honour, by direction, to inform you that your application is not being proceeded with at the present'. After Dr Bruehl had returned to Hawker in 1917, a letter from Keswick Army Barracks to the Hawker police stated that there was no record of Naturalisation and Bruehl was disfranchised by the Commonwealth Electoral Department for not being a British Subject. In a reply from the Hawker police it was stated that the doctor had lived in Hawker since April 1917 and was never away from home other than professionally. He had given no cause publicly to doubt his loyalty. Even so Keswick replied that in view of his age a prosecution would not be necessary but he should be paroled as a prisoner of war by the Hawker Police. The military office at Keswick asked the Hawker Police to keep an eye on Dr Bruehl and report on him and in November 1917 informed the Intelligence Section of the General Staff to make inquiries if Bruehl had been naturalised or not. The Department of External Affairs also requested to report on Bruehl's history and character. Three weeks later Bruehl wrote to the Minister of External Affairs informing him that he had taken the Oath, filled in all the required papers and had them signed by all authorities, but still had no certificate. During this time he had been pestered by the local police and even threatened with arrest if not appearing at intervals when professional duties prevented him from doing so. To add insult to injury Keswick wrote on 14 December 1917 that Bruehl had failed to complete his naturalisation in 1892 and warned that he was liable to prosecution and internment under the War Precautions Act. On 24 December 1917 Bruehl signed a declaration at Hawker stating 'I hereby swear that I will not take up arms against Great Britain, her Overseas Dominions, or her Allies, and will not act in anyway inimical to the interests of these countries until the end of this war. So help me God'. As a result he was released on parole on the condition that he 'strictly comply with the conditions of the Parole, Refrain from all acts of a suspicious nature, Report any intended journey from place of residence and Report any change of address. Not known, or if it was, not taken into consideration, was the fact that Bruehl during this time was a committee member of the Hawker Agricultural, Horticultural and Floricultural Show which was successfully staged at Hawker on 11 October 1917. Nothing was ever proved against Dr Bruehl and it is needless to say that it would have affected his work and mind to a great extent. In March 1919 he wrote a letter to Johann Viesel, possibly his wife's father or brother, which was intercepted by the Censors. In it he wrote that he was 'fearfully unhappy' about the state of affairs in Germany and longed to return to the homeland. 'We are heartily tired of this country', he wrote, 'as we can not enjoy the companionable and brotherly love which makes life worth living at home'. According to the Adelaide Censors of March 1919 Dr Bruehl planned to return to Germany with his family and stated on 26 March 'It may be possible shortly to gratify his longing to return to his Homeland'. However Bruehl had no intention of doing such a thing. His two sons Martin and Anton had made their way to America in 1919 and went into business and lived in New York. He planned to join them there with his wife and daughter. Unfortunately this meant another big hurdle to overcome. When Bruehl applied for a passport for his wife and himself he was told that this was not possible as he was not naturalised. America would not allow entry without it and consequently it took Bruehl more than a year and the help of the Hawker police, local politicians and others to get the required papers. On 7 June Hawker JP Mr B. Manson pleaded his case with A. Poynton, MP and said that Bruehl wanted to be with his boys in New York. To get a passport required to be a permanent resident of Australia, which Bruehl would not be if he left for America. Another problem was that if he did leave he would have to sell his surgery and all other assets and hand over the money to the Public Trustee. He would be allowed to take out only a small amount of money which was the Right of the Government under the Peace Treaty. On 22 November 1920 a farewell party was organised in Hawker for the Doctor, his wife and daughter, who all three received some very nice presents from the local community. Finally in December 1920 all money matters were settled and they were granted a permit to leave Australia by ship for America. The Doctor, his wife Minna and daughter Charlotte boarded the SS Ventura for the USA from Sydney on 27 January 1921. Little is known about the family in America except for Anton. He died on 10 August 1982 after having become a world famous photographer. He had a lot of his work published in Vanity Fair, Harper's Bazaar, Vogue, US Camera and many other publications. He produced WWII posters, industrial shots, his most famous The Cadillac V16 chassis in 1929. Other works included everyday people in Mexico and portraits, including those of Louis Armstrong and Marlene Dietrich. Charlotte, the first child born in Hawker became a pianist and music teacher. She later wrote a book on Australian Explorers under her married name Lohse.